I notice that people fit into two categories for home charging - those who just use "a plug" (15 amp, usually) or those who install a dedicated unit of some sort (Wallpod, Juice Box, Tesla HWPC, or something else). The reason I ask - take a look at my garage below. I'd like to install something outside but the 15cm wide surface as shown is the most practical location for it. Obviously too big for a Wallpod (the smallest wall unit that I'm aware of). All I need is a 10cm diameter plug! Is there any reason a 37 x 18 cm unit is necessarily? If a fuse/switch is legally required I'm happy to have it on the wall inside the garage. Is this something a licensed electrician familiar with EV charging could do? Q. Couldn't you install a Wallpod (etc) on the grey block wall? A. Yes, but the garage door is a full panel tilt-a-door. 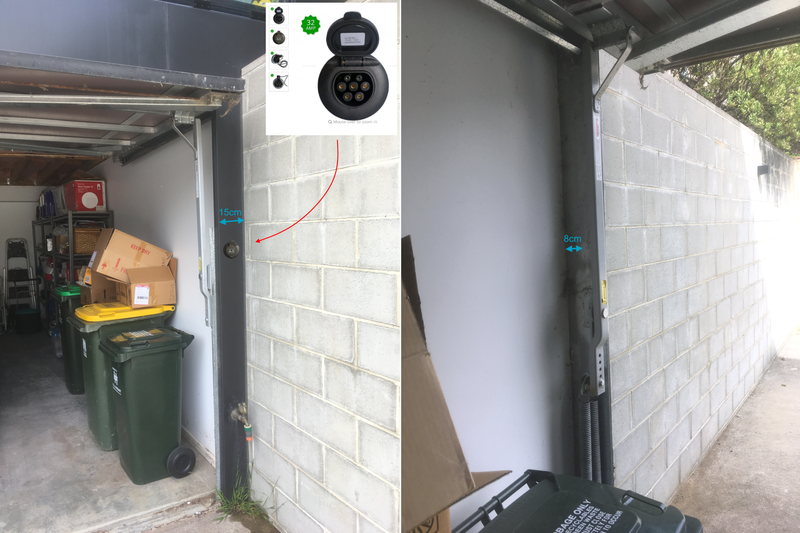 It couldn't go right next to the garage, it would need to go about 1.5 to 2m out - if the garage door opened while a cable was plugged in it would destroy both the cable and the wallbox. As well as needing conduit and looking terrible, that's where the kids play basketball/netball. Just looking to be damaged! Q. Why not install inside the garage? A. I'm planning that as well, but this is future proofing for guests, etc. Q. Why type 2? Don't you drive a Leaf? Q. What's that 8cm measurement about? A. That's the amount of available space *behind* that location - allowing for the springs from the garage door, when the door is shut. Thanks Bryce! I knew there must've been a reason, I just wasn't sure what it was! Hi Charles - so long as you are an electrician to be able to safely (and legally) build and hard-wire a home built EVSE, or get an electrician to put a separate circuit and socket outlet (i.e. with circuit breaker at the board) so you can plug in the EVSE you build, or have a electrician mate who is interested in building an EVSE for you to suit your needs - that should be OK. Probably building it into an enclosure and recess that enclosure into the plaster wall would be best from the look of your situation. Re load of an EVSE - have just published an article in ReNew magazine on the basic needs of an EVSE and consequent household wiring issues. (i.e. its effects on triggering rather expensive house wiring upgrades if you want the maximum power EVSE possible!!). Should be in newsagents this week (or in your letterbox in next few days if you subscribe). I have been looking into the charging at home garage options as I am planning to purchase an EV before the end of this year and am not sure if I would need to go with a dedicated charger instead of a simple type 2 outlet. (i) Electric storage water heaters with thermostatically controlled or continuously operating heating units. (ii) Boost elements of solar-heated water heaters. (iii) Air conditioners compliant with AS/NZS4755 and fitted with a DRED. (v) Electric Vehicle Supply Equipment (EV Chargers). (vi) Battery Energy Storage Systems compliant with AS/NZS4755 and fitted with a DRED with export limited to a 5kW inverter (export in excess of this limit will require an assessment by Energex). (vii) Other appliances compliant with AS/NZS4755 and fitted with a DRED. (viii) Heat pump water heaters. (ix) Other domestic appliances (e.g. air conditioners, washing machines and dishwashers) except where the appliance is duplicated in order that supply may be obtained on a different tariff for the same purpose during the restricted period. As point 5 there suggest EV Chargers are allowed, but would a standard outlet in garage qualify or do they require the outlet to be somehow restricted to the EV charger only that no other device could use it? But it does not clarify what makes that outlet dedicated? Does it require some form of signage or will it need to be locked to specific device so nothing else can be plugged into it? Does anyone have experience with this or can clarify what options I would have there, as I only have 1-phase power in my house and I believe my main fuse for the house is 80A, so getting a dedicated line to the garage would be something I would like to arrange.